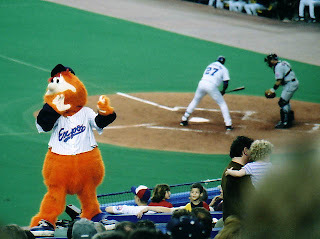 Could Youppi return for Montreal baseball? When interleague play takes over the month of June, the thought always hits me as I watch two National League teams play each other, and that thought is "Why don't they have the same number of teams in each league?" After a couple of hours of kicking the idea around, at 2 am on Saturday Morning, I created a new 32 team MLB, 8 divisions, 4 in each league. Only one team will switch leagues, and I would add an extra round of playoffs, a very unique three game playoff. Purists will hate it(ie Bob Costas), people who love the trade deadline will hate it, but fans would love it, and MLB Executives would love it because of the money. I also took a little bit of liberty with the two expansion teams to make sure that the geographic regions were close, so Portland, OR gets left out again. Without further ado, here are the two expansion teams. Nashville has supported a AAA team for years, and would make for a great geographical rival to Atlanta, Cincinnatti, and St Louis. It's a tourist attraction on it's own and does a great job supporting it's NFL team (I would mention the NHL here, but the NHL does not belong in Nashville, period). This could be a very successful franchise if the right ownership got in there. What better way to acknowledge that the MLB screwed the city of Montreal out of their baseball team than giving Montreal another crack at it, only this time making sure a new stadium is starting construction closer to downtown, and this time putting Montreal in the American League and allowing Boston and New York fans a chance to see their teams on the road. That alone would jump the attendance, tourism and everything else. Besides, if they put Montreal and Toronto in the same division, there is another built-in rivalry that would be born. These two franchises would even out the playing field, but Nashville would go the National League, and the NL West would give up the Colorado Rockies to the AL. Here is the division plan. Colorado should be an American League park, the South would create a world of opportunities for Tampa, and the Yankees-Red Sox rivalry could continue uninterrupted. The AL Central would remain almost unchanged. The Pirates move back to the NL East; Mets/Phils, Cards/Cubs, Dodgers/Giants rivalries stay intact; one of the most geographically sensible alignments ever. The Playoff scenario would be 4 division winners, 4 wild cards in each league, with a total of 16 teams in MLB making it into the playoffs each year. The first round would have a 3 game series, round 2 would be a 5 games series, then the League Championships and World Series would be 7 games a piece. More playoff games equals more revenue, more fan interest because more teams can make the playoffs, and a better chance of a cinderella story. It would also separate teams at the deadline as well and maybe get teams that wouldn't normall be buyers at the deadline involved. Attendance is at an all time high, it's time to capitalize. Just remember Bud, expansion means money. You like money. The answer is clear, EXPANSION YES!